Slightly rockered in both the tip and tail, the ETL Plus helps progressing beginners and intermediates go from smearing their turns to carving them. As a bonus perk, the rocker in the tips and tails will help the ski navigate off-piste when and if the skier should find him or herself in the woods. The Ezytrak 10 bindings come included and are adjustable to most adult boot sizes. 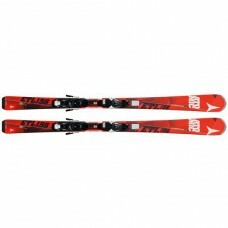 We recommend these Atomic ETL Plus skis for beginner to intermediate skiers that are primarily staying on the hardpack honing in their basic skills, but may play around in the fresh snow every now and again. Cap Construction: The topsheet of this ski drapes over the edge to form a clean and rounded finish to the side of the ski. This style of construction adds some torsional rigidity, and helps reduce topsheet chipping when the skis hit each other. Dura Edge: Treated solid steel edge holds up to abuse well. The hardness of the steel will keep its sharpness for a long time, and reduces the need to get your edges sharpened as often. Ideal Target Skier: Casual Cruiser: Sticking mainly to the groomed runs and always keeping speed in check, a Casual Cruiser doesn't even bother with the off trail snow, moguls, jumps, etc. EzyTrak 10 Bindings Included: The EzyTrak 10 is a great looking binding to complement your Atomic ski. The din range of 3-10 will accommodate any recreational skier and the track system adjusts to a wide range of boot sizes (229-336mm or 273-380mm depending on ski size). Tip Rocker: This refers to the early rising of the tip to get the ski on top of the soft snow, rather than pushing through it. When the skis are held with the bases together, it will look like the tips are bent, and spread away from eachother. Tip rocker also helps skiers pivot the skis, making tight trees remarkably easy, and gives the ski a surf-like feel. 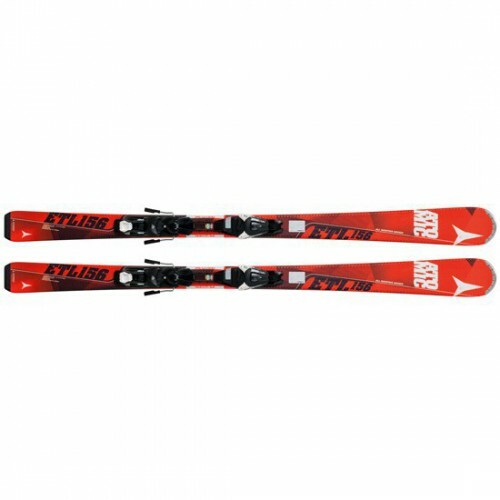 Metal Tip Protectors: These skis have rugged tip protectors made of metal that will help fight against chipping and damage to the tips, which is both a performance and cosmetic benefit. Textured Surface: Ideal for repelling wear and tear on the skis surface. Textured ski surfaces (aka snakeskin topsheet) are rough surfaces to the ski that hide or repel scratches keep your skis look new long after they are not. Originally designed for rental skis for obvious reasons, this surface is now available on a wide variety of retail skis as well since everyone likes their skis to look nice.